Ricotta Cheese is an Italian whey cheese made from sheep (goat/cows) milk whey. You can make your own ricotta cheese at home, they are very simple. They are excellent source of protein, calcium and vitamins. In every single cup, you got 27 gms of proteins. If you are vegetarian like me, you can take a lot of protein from ricotta. If you are weight conscious, they buy fat-free ricotta. Coming to the recipe, Ricotta cheese peas sandwich is a yummy, healthy and filling sandwich made with ricotta cheese, peas and other flavorful spices. 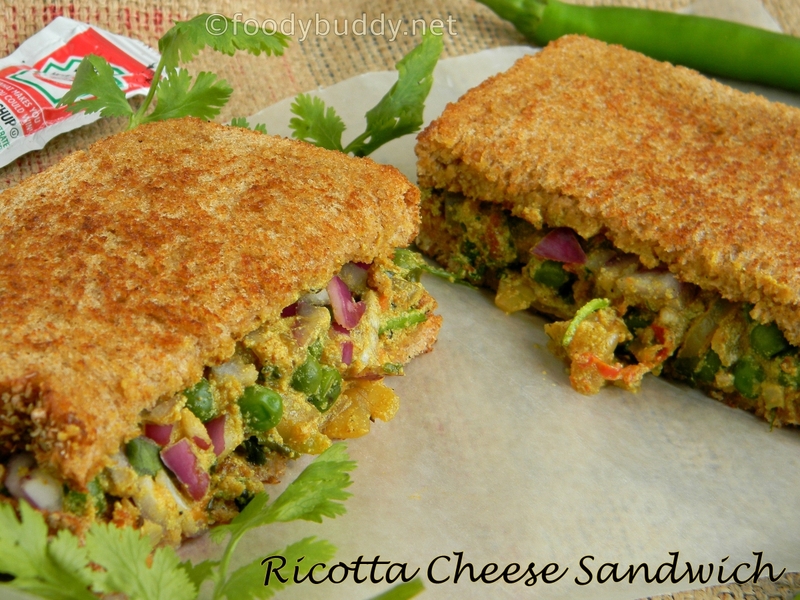 Cumin and dry methi gives a nice flavors, ricoota adds a creamy texture to this sandwich. If you don’t get ricotta cheese in you place, you can substitute with paneer or tofu. Serve this sandwich with any soup or any fruit juice for complete breakfast. Heat a pan with oil, add cumin seeds, after it sizzles, add onion, garlic and green chilly, sauté well until it turns golden brown. In a medium flame, add turmeric powder, red chilly powder, garam masala, sauté well for 1 min. Add peas and tomato, fry for a min and add water, cover and cook it for 2-3 mins. Open the lid, add salt, pepper and dry methi leaves. Turn off the flame. Finally add ricotta cheese and cilantro, mix well. Toast the bread with some butter. Assemble the sandwich by placing ricotta cheese stuffing, add raw onion, on one bread. Place the other bread on top. Gently press both the bread together. Slice the sandwich diagonally to create finger sandwich. 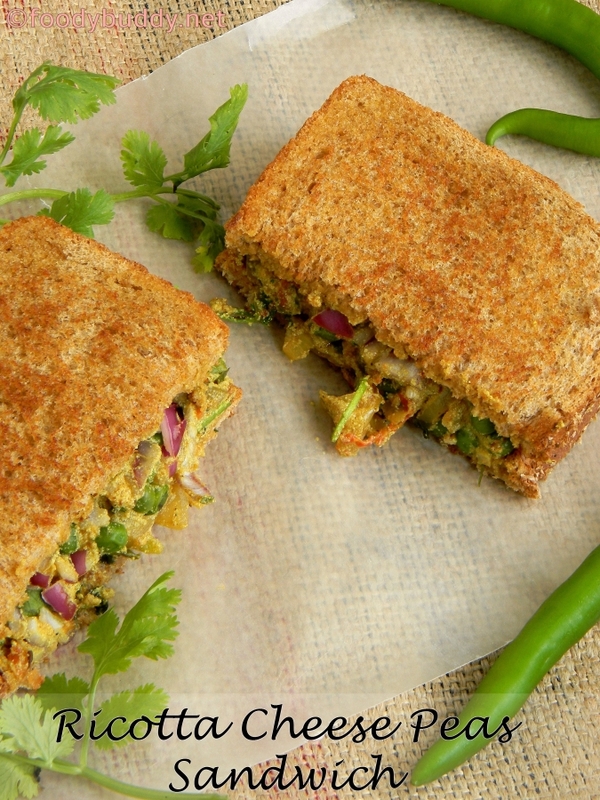 Yummy, healthy ricotta cheese peas sandwich is ready to serve with soup or fruit juice. You can have mayonnaise or any cheese or any dressing in your sandwich. If you have lettuce, use that in your sandwich. Add any veggies of your choice like mushroom. Add ghee in place of butter. Substitute paneer in place of ricotta cheese. 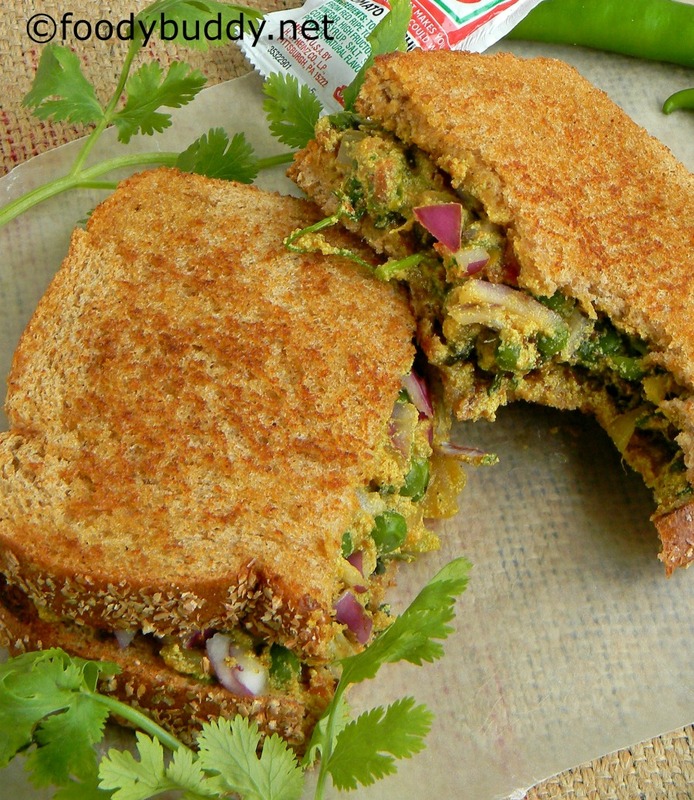 Tags: ricotta Cheese Peas Sandwich, ricotta cheese sandwich recipe, cheese sandwich, peas sandwich, healthy sandwich, ricotta sandwich, breakfast sandwich, high protein sandwich, lunch sandwich, sandwich ideas, vegetarian sandwich, paneer substitute sandwich. This entry was posted in Breakfast, Budget Meals, sandwich and tagged cheese sandwich, high protein breakfast sandwich, ricotta Cheese Peas Sandwich, sandwich ideas, vegetarian sandwich. Rich, Yummy and delicious.. Luving it!